Starting in 1877 with contractor caboose CP #1, various lengths and shapes of pre-1948 wood cabooses are featured along with every type of steel caboose produced from 1948 to the end of CP caboose production in 1981. 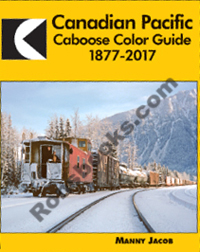 Over 250 photos, 20 exhaustive roster tables, highly-detailed captions, modelling notes, paint schemes, lettering details, disposition information, preserved cabooses, new owners, shoving platforms and much more. Don't miss out on this long-overdue history of the nearly-extinct CP caboose before all are gone forever!